Neptune’s production of Norm Foster’s play balances heavy moments with tender humour. 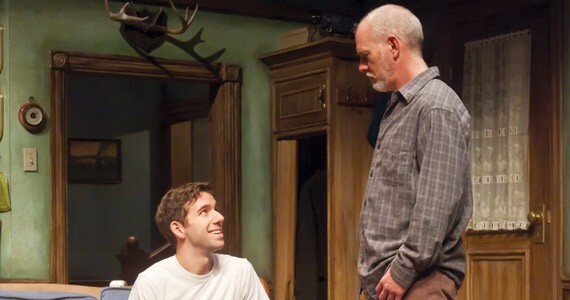 Mending Fences is the story of 28-year-old Drew (Iain Stewart) who returns to a farmhouse in rural Saskatchewan to re-connect with his emotionally-distant and difficult father after 13 years apart. While this set-up may not sound laugh-out-loud funny, in the hands of playwright Norm Foster, there are plenty of comic moments and zingy one-liners to balance out the heavier emotional scenes. Drew’s father Harry (Jack Nicholsen) hasn’t learned from the mistakes of the past. He pushed his wife and teenage son out of his life through neglect and selfishness, and he runs the risk of doing the same with his neighbour-turned-lover Gin (Jane Spidell). Fortunately for him, Gin is a tough cookie with a great capacity for love. The play’s structure is layered and sophisticated, but the humour and message are accessible and down to earth.